The founding of the Berliner Philharmoniker on the first of May, 1882 is celebrated annually with a concert in a European city of cultural significance. 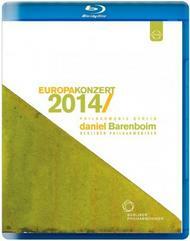 In 2014 the Europakonzert took again place in Berlin. The concert was conducted by a man who has been associated with the Berliner Philharmoniker for 50 years: Daniel Barenboim. Otto Nicolai�s The Merry Wives of Windsor is based on William Shakespeare�s comedy of the same name, and its lively overture has long since secured a place on the concert stage. Also inspired by a Shakespearean comedy hero is Edward Elgar�s symphonic study Falstaff. We then turn from comedy to the tragic twists of fate: the Fifth Symphony of Piotr Tchaikovsky is characterized by a sombre main theme that for the Russian composer symbolizes �a complete resignation before fate, which is the same as the inscrutable predestination of fate�.